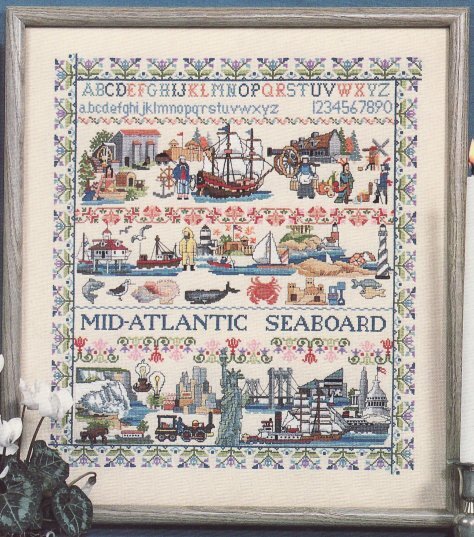 I used to subscribe to The Cross-Stitcher. Many of the designs were quite nice, but I realized my collection was getting ridiculous in size so I stopped. As of early 2008, I'm almost done with this, finally! I began it before moving across the country, and it has languished as my attention has been on other hobbies. All I have left are the fort, mill, and native scene in the upper left, as well as the matching area of the border. At my current rate of progress, it will be done in... 2012. It's a Truth We Must Remember According to eBay, this is from a(n out of print) book titled Bathroom Humor. 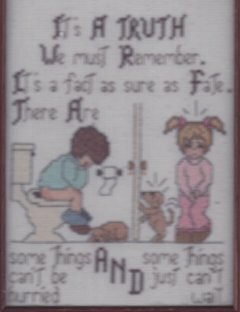 I received the chart from my grandmom, who has had her own stitched one hanging in her bathroom for as long as I can remember. Curiously, it was the first design I completed, and it was also the first design my sister completed. Also available for purchase at PatternsOnline. An upright piano pattern (not this design, but by the same designer) is available for purchase at PatternsOnline. Legal stuff: Finished projects displayed with the permission of Stoney Creek. Trumpet and Clarinet ©1990, Teddy's Alphabet Train, Grand Piano and Universal Language ©1995. These images may not be copied for purposes other than viewing this page. If you like the designs and want to stitch them, I highly recommend purchasing the books. They have many other excellent designs as well. Stoney Creek's official retailer is Marilyn's, and they sell many things, including the full Stoney Creek line, as well as (sanctioned) photocopies of the out-of-print books (such as Book #78, featured above). I have ordered the "chart packs" from these books, and they are of excellent quality.